Yay! 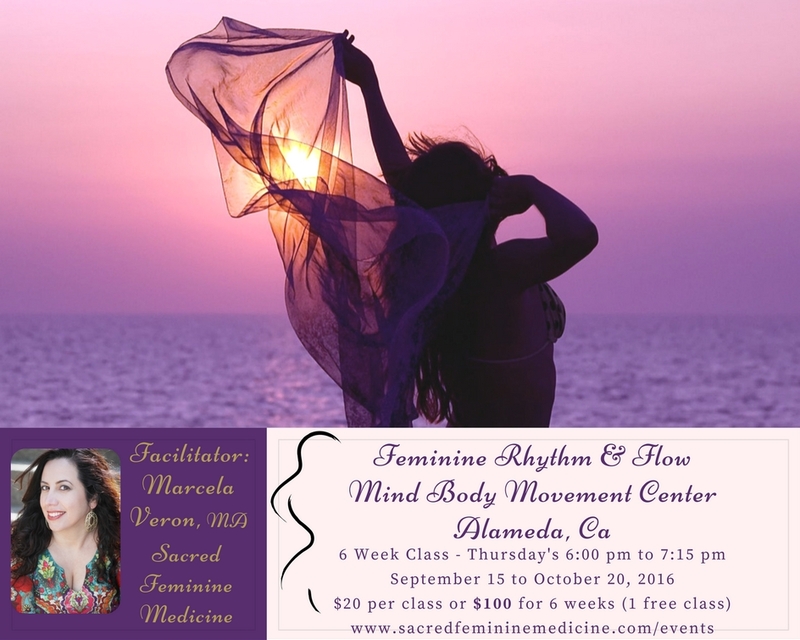 I am so delighted to welcome you to the Feminine Rhythm and Flow 6 week class series. I am so glad you've decided to say yes to yourself in this powerful and soul nourishing way. I am really looking forward to meeting and connecting with you as well as begin our journey together honoring your feminine essence. ​If you have any questions, please feel to e-mail support@sacredfemininemedicine.com. If you need to reach me, you can call or text me at 415-484-2113. PS Marcela also offers private coaching if you'd like personal attention and to go deeper in your practice. Please click here to schedule some time for a conversation to learn more about her VIP programs. Free parking available in the lot next door. Registration begins at 5:45 pm. We start tuning in at 6:00 pm. Please be on time to start with the flow of class. Please bring extra water or nourishing drinks. Circle closes at 7:15 pm. Note: There is a class after ours that begins at 7:30 pm. Wear clothes that are easy to move in. This could be a long yoga pants or knits (no jeans please). Optional, please bring a triangle scarf or shawl to wear around your hip (hip scarf) to help in attuning and enhancing to the movement. We will be using it in the exercises and will also help you keep warm just in case it's cool in the space. I will have extras to borrow and purchase if you'd like. Please bring extra water, a journal to write in to take any notes and a pen/pencil. For the Altar, please bring something that represents your connection to your feminine, what inspired you to join the class, or something meaningful to you.